I’m off to Memphis to speak to St. Mary’s and St. Agnes (yep, it’s a double header), but I just wanted to share some pics and updates from my last two events. On Monday, I talked to a group of English and Creative Writing students at East Hamilton School outside of Chattanooga. We did a fun writing exercise (I’ll post on that later), and I talked about how I became a writer and the process of bringing a book from rough draft to finished copy. (I still feel weird talking about myself so much.) The EH group was awesome. I got some great questions. Go, Hurricanes. What is deconstructed baklava, you ask? It’s the dessert of the gods. 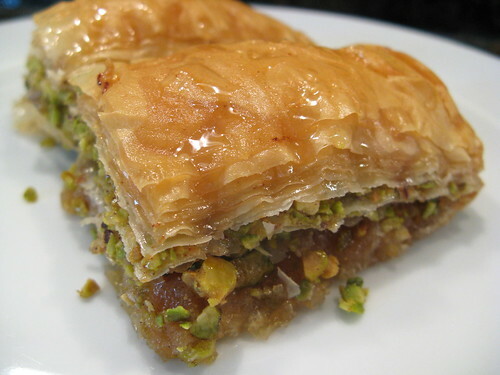 Baklava is a traditional Greek (and Turkish) dessert pastry made with honey and chopped nuts. To “deconstruct” it, we used the same flavors and put them together in a new way. We made pastry cups from sheets of phyllo dough sprinkled with sugar, then put a scoop of homemade honey ice cream in them and sprinkled with pistachios and honey. We also made pistachio brittle, but it didn’t have time to get hard enough to break into pieces. You win some, you lose some in the kitchen, as Julia Child said (ok, she didn’t say that but she would have in this case). Here are some photos from the event. A really cool video also coming soon. Gotta hit the road. More from the Pizzapalooza Tour later.